As usual, you can put your suggestions, questions and general musings in the comments section below and I’ll do my best to respond. Meanwhile I will be thinking of a more anthropological object for next week (in line with suggestions made last week – see I was listening). Ok. Carnivoran. Looks doglike, but that’s a huge saggital crest. Hyaena? The skull is 14cm (5.5 inches) long. Too small for a hyaena. Not a red panda- the skull is far too long, I think it might be a CORRECT FAMILY though. A CORRECT ANSWER? The length of the skull seems right. There seems to be a reasonable amount of variation in saggital crest size- some have it, some don’t. I have spent the last 20 minutes comparing this to other skulls and the closest match was a german shepherd. I don’t believe thats correct as the teeth were different, what looks like a crest of bone was flatter, and the bone that wraps the cheek was more curved. hmmm. First question then how big is this beauty? The skull is 14cm (5.5 inches) long. 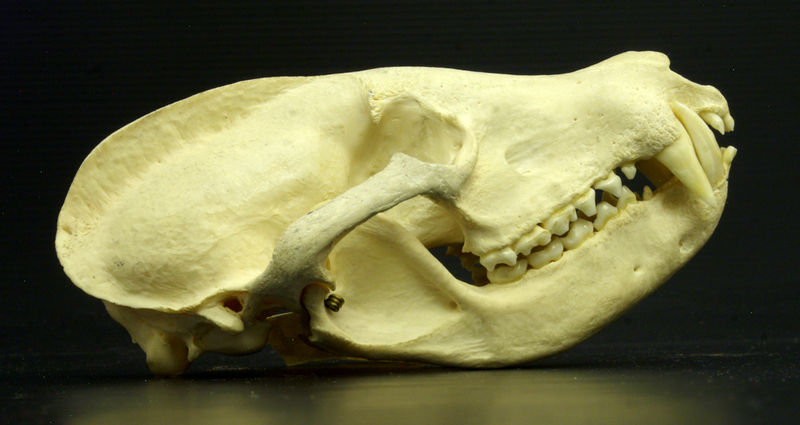 A bit on the small side for a german shepherd and you’re right about the teeth – it’s not a canid. The sagittal crest can vary a lot within a species though, as can the zygoma (my cheek-bony namesake). I have never come across this animal before. I’m certainly glad I did not go for my first thought as that was way off! I too was browsing skulls unlimited but I didn’t happen upon the correct answer, alas. As Dave Godfrey says, saggital crest is huge which suggests bone crunching jaw muscles. Combined with the big flat molars is suggests a scavenger of some kind that likes to eat bones. Hyena is perhaps too obvious, so I’m going for its cancer prone marsupial equivalent. Actually, this does look remarkably similar to a Tasmanian devil skull, but the braincase extends further back and the zygoma is less massive (you can’t see it in this photo, but the skull is also narrower). So it’s not Taz. I’m going for a complete guess, is it some sort of great ape? Nope, I’m afraid not. Great ape skulls are much flatter in the facial region, with a much more rounded braincase (although males do often have similarly developed saggital crests that can hide that). My first thought was dog-like, but I’m going to piggy-back gimpy’s answer and plump for it’s larger, more extinction-prone neighbour. Alas, no. However, I was quite surprised at the similarity between these species, particularly considering that humans are more closely related to shrews than this species is to a Tasmanian devil. Convergent evolution is incredible. Following Dave Godrey’s thread, I’m going to plump for a CORRECT SPECIES skull. I think Gimpy’s right. Tasmanian devil? See my responses to Gimpy and jonpaulkaiser – I can totally see where you are all coming from though! but have to say tasmanian devil now someone else has said it! Fossa would be cool, but it’s not one of them (they have wider skulls with a shorter muzzle region. Not a Tasmanian devil either! We’re considered African hunting dog, badger (various) and fossa here but none of them are right! Is it a mustelid of some sort? You and @happymouffetard are looking in the right sort of places, but you’re right in saying it’s none of the ones you’ve considered. It is also not a mustelid of any sort. That’s a placental tooth pattern, that is. On that note, it’s not a canid, either, because I don’t see any carnassials. Actually, that’s not a particularly derived pattern at all – hello, premolars! What would you say if I said it might be omnivorous, or a non-Carnivoran carnivore? Good skills – placental tooth pattern, no distinct carnassials and indeed a pretty generalist pattern. You are absolutely correct in saying it might be omnivorous, although it is a Carnivoran omnivore. Hmm. I can’t think of any Ursid that might have a skull that small, unless it’s a juvie, and it doesn’t look like a juvie. oops…sorry, my browser didn’t show all the comments so didn’t see Paolo’s responses…. It’s a good observation though! …and I ended up on FMO #48. Mwahahahahahaha! Soon I will own da internetz! Needless to say, I’ve not repeated myself. Here’s the link to the answer for FMO 48 for anyone who missed it. Alright, I REALLY HAVE to do some non-avian archosaur work, now. So final guess – CORRECT ANSWER? Um. I mean the first two syllables of that word, obviously. That’s what I’m doing now ! But you must be faster than me. It’s a handy site for sure! Its how I check my guesses! This is one I’m leaving for the experts, but just to say thank you for opening the #FMO earlier than usual. However I spent the morning reading @cromercrox’s novel. Ooops, sorry, just noticed I’m logged in on the wrong blog – this is the one I run for the photography group, sorry. The harder I look at this skull, the stranger it gets. So I am going to guess that it´s either a binturong or a giant wooden badger. But I was totally blindsided to learn that someone was actually reading my novel. Thanks … I hope you´re enjoying it! As you can see rfrom the setting I was influenced by old fashioned museums at an impressionable age. Yes, enjoyed it very much – even the very gruesome bits about Victorian taxidermy that are all too real, I suspect. Altogether very Gothic. Sorry, wrong log-in again! That was me … I shall give Paolo the book next weekend. Hmmm. Tricky, given the size, the zygomatic arch and, particularly, that sagittal crest. But I’m going viverrid. Specifically… erm… Civet. Even more specifically… African Palm Civet, Nandinia binotata. No, African Civet. Civettictis civetta. N.binotata is too small. Or, a “pimped-up raccoon” as my associate in the room has just called it! Actually, your associate is a bit closer to the correct answer (if rather less scientifically precise)! It’s not a CORRECT ANSWER is it? I mean, just count the blotches. Not genetty or blotchy I’m afraid!